Wife After Death . . . Written by the author of TV series Rising Damp, Eric Chappell. 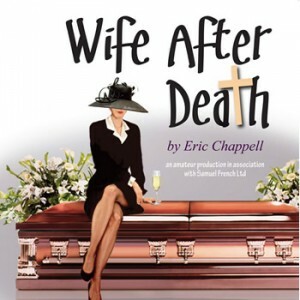 Wife After Death is a story of the loss of Harvey Barrett, who has just lost his best friend - a successful television comedian - and decides it is time to cash in. The death leaves a huge void in the lives of his closest family and friends and as they gather to give him a fitting send-off, they discover they know rather less about him than they thought. Choking back the tears and protesting their love for the much-loved comedy legend, the mourners set about exploiting his comic legacy for all it’s worth - but who is the mystery woman? _ The recently deceased comedian in “Wife After Death” had been a serial womaniser whose affairs only caught up with him on the day of his funeral. It emerged he had betrayed the trust of both his agent and his scriptwriter. 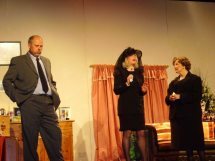 It is their response together with the reaction of the unfaithful wives and a grieving widow that form the plot of Eric Chappell’s comedy. 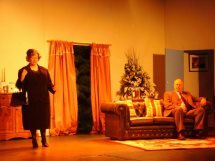 His clever script was brilliantly brought to life by a very talented cast from the Princess Theatre Club at Hunstanton. Their polished performance under the direction of Mick Yates was appreciated by a total of some 500 patrons attending three shows over two days. Thanks to Rae Steward and Mick Yates for the fantastic photos. 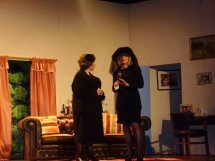 Expectation was high as I took my seat in a reassuringly full auditorium for the Princess Theatre Club’s 2013 offering “Wife After Death”. 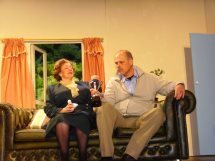 This little gem of a play is the work of television comedy genius Eric Chappell (“Home to Roost”, “Duty Free”, “Only When I Laugh” and the everlasting “Rising Damp”) and had the feel of a semi-autobiographical piece. It was comic gold from start to finish but, as is so often the way with brilliant scripts, it still needed quality perfomances to bring home the big laughs. 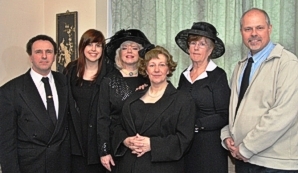 The story was reassuringly simple, starting with the funeral of successful comedy actor Dave Thursby. Mourned by his wife Laura, his writer and best friend Harvey (wife Vi in tow,) and Agent Kevin with his wife Jane, they are joined by mystery woman, Kay, who turns out to be David’s first wife and …. well…. not much to be honest, and that was fine because the excellent dialogue literally spoke for itself. 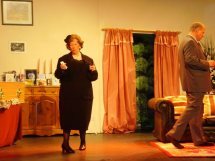 The set by Mick Yates, Rae Steward and Albert Ware was a straightforward and totally appropriate box set, nicely dressed and complimented by some simple but effective lighting (unaccredited). Of the cast, Barbara Dennis was solid as the first wife, Kay, alongside pretty Amy Lunn as theatrical agent’s wife and sometime conquest of the deceased, Jane Prewitt. Mick Yates worked hard as friend and agent, Kevin Prewitt, even if he found himself just a little overpowered at times by the three excellent leads. 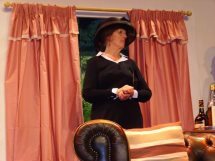 Elaine Verweymeren had the straightest role of the three, but still managed to collect a few laughs along the way with a delightful performance as grieving (and often bewildered) widow, Laura. Her work in setting up the gags was vital in a piece such as this and she never missed a move. 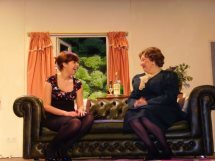 I have seen Sharon Yates on stage at this theatre a few times but I have never seen her more at home as she was playing comedy sidekick (and also sometime conquest of the deceased) Vi Barrett, belting out one-liners or setting them up for the comic lead. Her characterisation was spot-on and with only one minor exception was sure-footed throughout. I save the penultimate paragraph for the outstanding John Giller, who gave a beautifully measured comic performance that oozed confidence and displayed a real feel for the timing of the many gags he had to deliver. He was compelling throughout and even when the pace dropped in the second half he made sure the play never dragged. 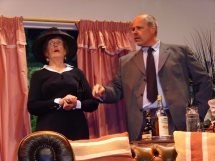 Hearty congratulations to Director and Society Chairman, Mick Yates for getting the best out of a quality cast, although I do think that the script was probably the star.